On this map, the red dots are methane seeps discovered in 2012 and supplemented by other USGS cruises in recent years. The crosses are sites of previous federally sponsored dives (HOV and ROV). During this expedition, scientists plan to conduct three dives in Boxes 1 and 2 and one dive in Box 3. Image courtesy of the U.S. Geological Survey. Download larger version (jpg, 1.4 MB). 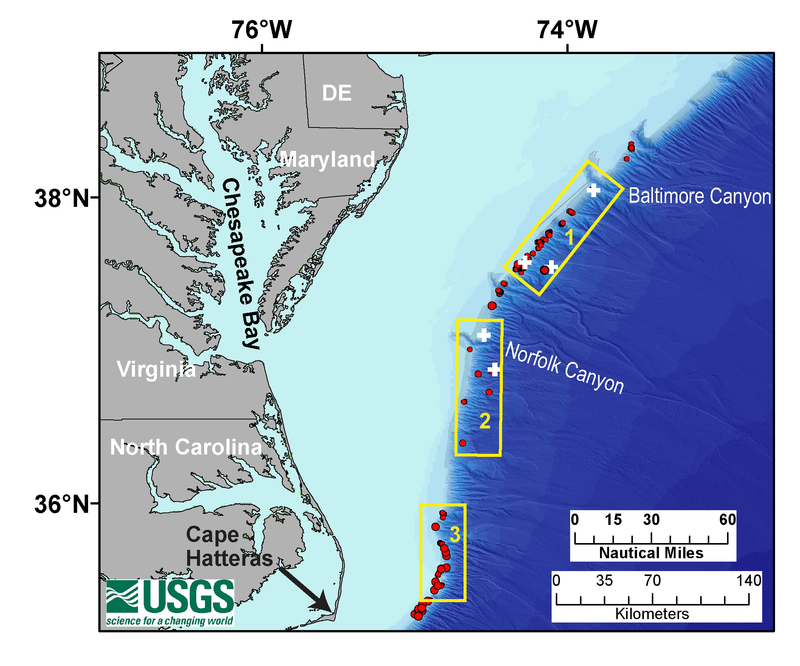 The IMMeRSS (Interagency Mission for Methane Research at Seafloor Seeps) expedition focuses on the geology, ecology, chemistry, and physics of methane seeps on the U.S. Mid-Atlantic margin between Baltimore Canyon and Hatteras Canyon at water depths of 400-1,600 meters (1,300-5,250 feet). The expedition is being led by U.S. Geological Survey (USGS) scientists in collaboration with the British Geological Survey and with support from NOAA’s Office of Ocean Exploration and Research (OER), the USGS, and the U.S. Department of Energy. Exploration activities are being conducted during May 3 to May 11 from the Research Vessel Hugh R. Sharp , managed by the University of Delaware, and using the Global Explorer remotely operated vehicle (ROV), managed by Oceaneering, Inc.
seafloor vents that emit gas bubbles. Gas hydrate, a solid form of methane and water stable at low temperatures and moderate pressures, is also present near some gas seeps. Rare, slow-growing, deep-sea corals are also sometimes found at seeps, as well as in other locations. Seafloor image at ~425 meters water depth at a seep site on the Virginia margin. 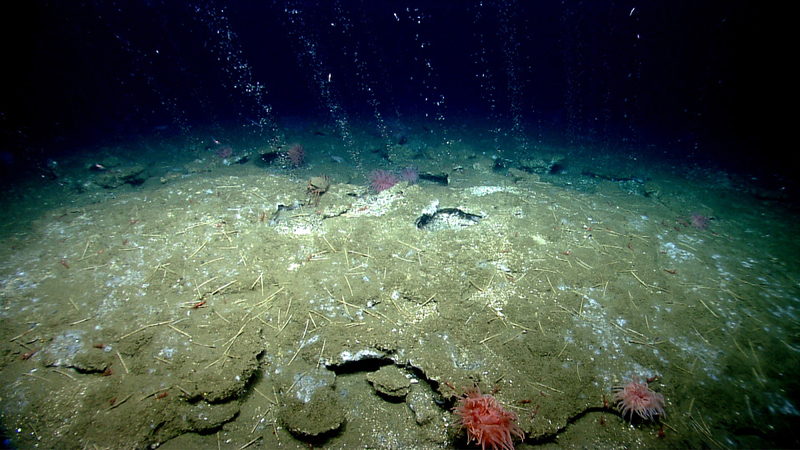 Authigenic carbonates pave the seafloor in the foreground and at least nine methane bubble streams can be seen in the background. Image taken in 2013 by the Deep Discoverer ROV, managed by the NOAA Office of Ocean Exploration and Research. Image courtesy of the NOAA Office of Ocean Exploration and Research, 2013 Northeast U.S. Canyons Expedition. Download larger version (jpg, 3.3 MB). During the IMMeRSS expedition, scientists are using the Global Explorer ROV to visit up to seven methane seeps, three of which have been the sites of earlier dives funded by U.S. federal agencies. 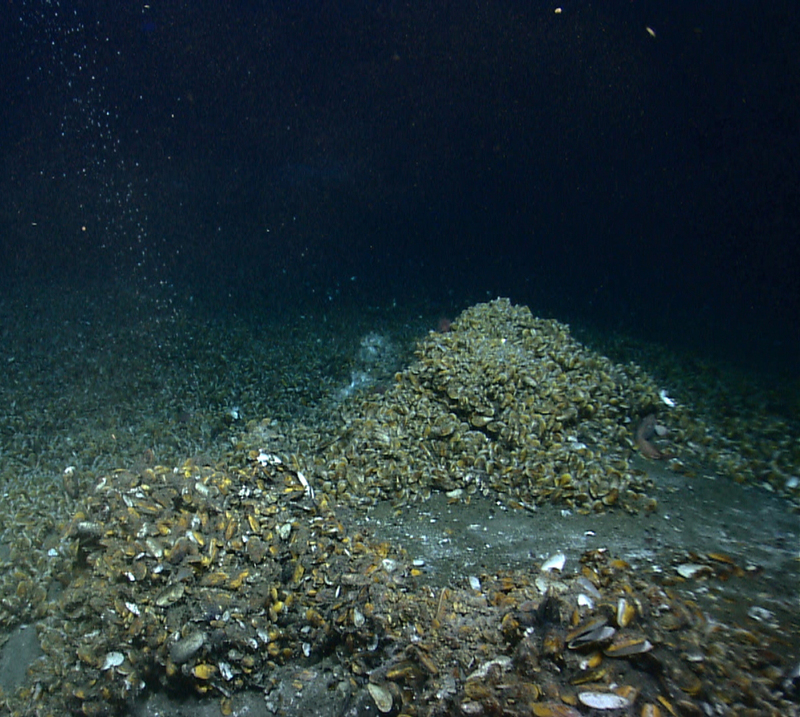 Chemosynthetic mussels encrusting a carbonate mound at one of the so-called Norfolk Canyon seeps at ~1,400 meters water depth. Bubbles that make up one of the observed water column plumes are visible on the left side. Image taken in 2013 by the Deep Discoverer ROV, managed by the NOAA Office of Ocean Exploration and Research. Image courtesy of the NOAA Office of Ocean Exploration and Research, 2013 Northeast U.S. Canyons Expedition. Download larger version (jpg, 8.7 MB). A key goal of the expedition is obtaining MDAC samples for geochronologic analyses (determining the age of rocks). These ages will constrain the timing of methane emissions relative to major oceanographic and climate events in the Northwest Atlantic Ocean since the peak of the last Ice Age (~18,000 years ago). Researchers are also sampling seafloor (benthic) organisms, such as chemosynthetic mussels, to characterize the community ecology and determine similarities with fauna at other seep communities on the U.S. Atlantic and Gulf of Mexico margins. Geochemists are using rock, sediment, water, and gas samples to infer the source of the methane emissions (microbial processes versus processes similar to those responsible for producing petroleum) and to understand how the environment influences seep benthic ecology. Geophysicists are producing detailed seafloor maps near the seep sites and imaging water column methane plumes with acoustic instrumentation. Taken together, the new IMMeRSS expedition data will constrain the timing and source of methane seepage, discover new seeps, and facilitate comparisons of seep ecology and geochemistry to other locations in the world's ocean basins. The cruise also features a substantial outreach component. During the ROV dives, Oceaneering, Inc. will provide continuous live videostreaming, allowing the public to see seafloor features as they are encountered by the ROV. The USGS is using social media to provide explanatory content for the videostream and to link to background information posted on the USGS website.